Teaching basic vocabulary to your students doesn't have to be boring. 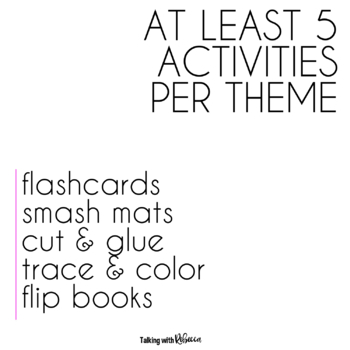 These 9 themes with 5 or more activities apiece are going to engage your students and be low or no prep for you, making speech therapy a breeze! SAVE SAVE SAVE with a growing bundle! Basic Vocabulary flashcards and activities are coming to you with a final 20% discount! This growing bundle is now complete, and you can still save by grabbing these nine units worth $41 for only $32.50! • Black and white versions of all activities! Some units include extra activities! The farm unit includes Bingo, and the ocean includes dice and feed the shark!! 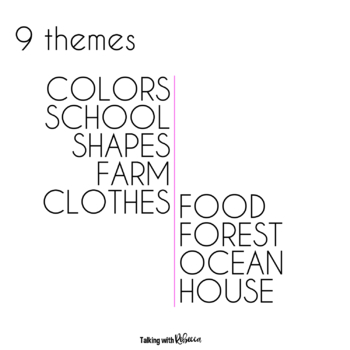 Each activity comes in color and black and white and can be used for pretty much double the activities! For example, spin and smash becomes spin and color in black and white. 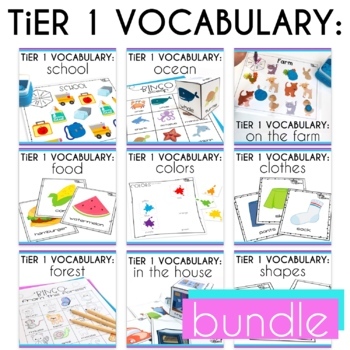 The color flipbooks work for teacher/classroom copies as well as sorting activities! BONUS: pull out two units' color flipbooks and have students sort which items belong in each category! Exclusive content will be added along with the school unit!